Summer is a great time to spend some time in the water. Water sports are fun activities that can get you active and keep you cool. For men, you can’t really swim without the proper gear. The first item that comes to mind is swimwear. 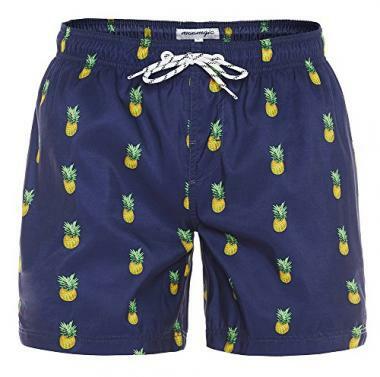 A popular choice is men’s swim trunks. A pair of top rated swim shorts for men can actually be used for just about any water activity. Swim trunks are versatile, and it would be best to invest in a few different pairs. It can be difficult when it comes to choosing which pairs. There are a lot of different styles and options available, so it can be overwhelming to determine which pair would best serve your needs. Our guide selects 10 of the best swimming trunks for men and provides information to help you decide what design and features you need. Whether you want to lounge in pool floats or experience open water swimming , with our guide, you can find the best swim shorts for men that will serve you through a variety of activities. 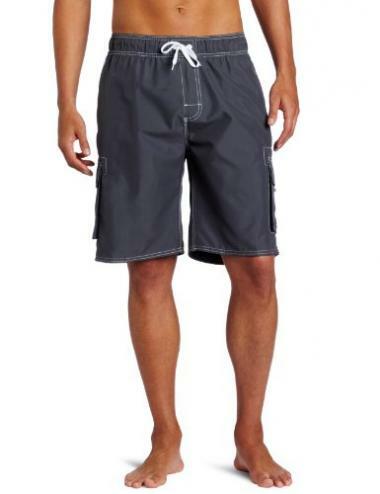 These top rated swim shorts for men are made of 100% polyester. They have a quick dry microfiber that is UPF 50+ and can be machine washed. The polyester material is lightweight and durable, as well as comfortable. It has triple needle side seams, which offers the highest quality. There are side seam pockets and cargo pockets, which gives plenty of storage options. It has a comfortable mesh lining and a full elastic waist with a drawstring closure. Men’s swim trunks reviews state that they fit true to size. These Men’s Swim Trunks have a 4-way stretch and an elastic elongation of 10-15%. They will easily adapt to different activities They are light and comfortable and won’t deform after long-term use. They have two front pockets that are open and one back pocket with a Velcro closure. The material is anti-fade and it has a brief mesh lining to ensure they are not see through. There is an elastic waistband. It has water repellant technology that dries fast. They are perfect for swimming, beach vacations, leisure, surf, and all-weather sports and activities. They are the perfect length and true to size. 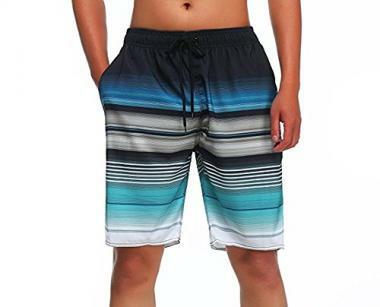 These swim trunks are made of 100% Polyester and have a slim fit design. It is recommended to go one size up if you prefer a looser fit. They come in a variety of sizes with: S/M/L/XL/XXL/3XL available. They have a mesh lining and are quick drying. They have three pockets. One pocket, on the back, has a Velcro closure with drainage. They have an elastic waist and fit above the knee. There are a variety of fun patterns available. 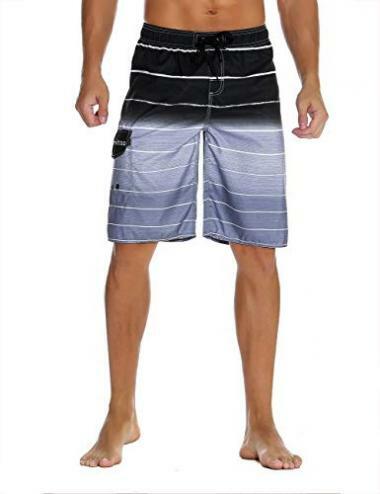 These swim trunks are quick dry, breathable, and lightweight with 100% polyester material. They have an elastic waistband and adjustable straps. There is a mesh lining and one Velcro closed pocket. They are suitable for a variety of summer or holiday activities. They have a UPF 50+ to protect your skin from the sun. Most styles will hit at about the knee. 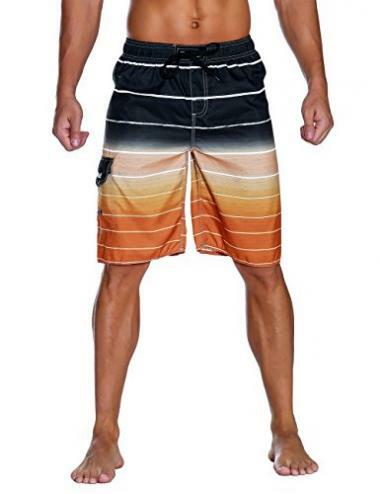 These Men’s Swimtrunks are part of the Surfista Waves series. They are perfect board shorts that are made of 100% polyester. They have an elastic waistband with drawstring. There is an inner mesh lining and 2 Velcro secured cargo pockets. It has a UPF 50+ rating to protect your skin from the sun’s ultraviolet rays. They are quick drying and water wicking for the best conditions inside and outside the water. They have enhanced protection and resilience for flexible movements. These Men’s Rally Volley Swim Trunks are made of 100% polyester brushed microfiber. They have a mid-length and are a water short with a drawstring waist. They have a full mesh lining and side seam mesh pockets. They have the trademarked VaporPlus fabric for quick drying and long-lasting durability. They have a UPF 50+ to protect your skin from the sun. The fabric is soft and lightweight. They have a 19-inch seam, which makes them likely to hit just above the knee. They are a versatile and innovative design. These Men’s Colorful Swim Trunks are made of 100% polyester. They feature a drawstring closure as well as quick dry, breathable, and lightweight features. They have a mesh lining with Velcro cargo pockets to conveniently hold some of your stuff. They are available in a variety of colorful stripes pattern you make you chic and fashionable. They are functional for daily wear, holidays, and beach activities. They have a UPF 50+ rating to protect you from the sun. 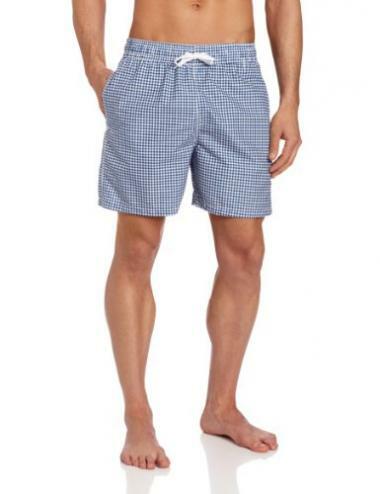 These Quick Dry Board Shorts are made of 100% polyester. They have a mesh lining with an elastic waistband and adjustable straps. There are two side Velcro pockets. The material is quick drying, breathable, and lightweight. They are suitable for a variety of beach activities. The Men’s Monaco Swim Trunks are made of 100% polyester and have an elastic closure. They can be machine washed and have a quick dry microfiber material. The material has a UPF 50+ rating to protect you against the harsh sun. They are lightweight and durable. There are triple needle side seams that deliver the highest quality. They have a long seam of approximately 17 to 18 inches. There is also a comfortable mesh lining. The waist is full elastic and have a drawstring closure. Men’s swim trunks reviews say they fit true to size. These Men’s Swim Trunks Quick Dry have the feeling of total freedom. They are super comfortable with no restrictive mesh. They have professional fabric that is quick drying as well as a super soft and smooth feel. They are cooling and offer sun protection. APTRO ensures that their design allows you to flex and move to ensure you are always comfortable, throughout the summer. They have a three-dimensional cut that rests just at the knee. They have a relaxed fit and a neat car line technology to ensure they have a sleek look. They are low-key luxury that are perfect for casual and holiday use. They have an elasticized waistband with a drawstring to better fit you. There are two side pockets that can be expanded to hold a water bottle or other small accessories. There is also one back pocket with Velcro. Swim trunks for men are a great everyday swimwear item for summer. When you don’t need specialized gear like wetsuits, a pair of swimming trunks should serve for all your warm weather swimming needs. Swimming trunks for men can be the perfect thing to wear while snorkeling to the swimming pool or to have on your beach day checklist. With top rated swim shorts for men, you can be active or relaxed. However, there are a lot of different designs and styles, as well as fits that you can choose from. These are features that are important to consider before you make a purchase because it will determine how well the swim trunks work for your needs. It is important for your comfort and modesty, that you choose a pair of swim trunks that best suit your needs. As well, we have answered some frequently asked questions so that you can have all the information you need to find top rated swim shorts for men. There are many, many different styles that you can choose from in men’s swimsuits. There are shorts that have longer lengths that go above or below the knee, as well as shorter lengths that can be as short or shorter than mid-thigh. It may be up to your activity the length of shorts you need. Keep in mind that it will ultimately be down to personal choice. You want to feel comfortable in your shorts, so choose a length that suits your needs. There are also different styles that have pockets or don’t have pockets. Some styles have open pockets, like a normal pair of shorts and others have closed pockets. Closed pockets can be handy to keep any small gear items close by. They may feature a fold over flap with Velcro or a zipper closure. Pockets can make the shorts bulkier, so again, it will be personal preference as to whether you want them in your short style. Other features of the style are the waist and pattern. We will get more in depth into these below. This is the most important feature of swim trunks for men. The fit should be the first consideration before all other features because it will determine how comfortable your swim trunks are. The fit of your swimming trunks should be perfect. You don’t want them to be too tight or too loose. A pair of swim trunks for men that are too tight can be restrictive and cut off circulation. Swim trunks that are too tight in the waist can be incredibly uncomfortable for the user. The will dig into the skin and make movement hard and uncomfortable. On the flip side, a pair of swimming trunks that are too large can be a nuisance because you have to constantly pull them up to your waist. If they are too large, they won’t even stay on your body. You don’t want to have to constantly adjust your shorts. Ideally, the fit should be snug enough to stay on your body, but not too tight that it makes you uncomfortable. There are a few ways to ensure that you find the proper fit of swimming trunks for men. If you are shopping in-store, you can try on before you buy. This would be the best method if you are unsure of what brand you would like. In-store, you can select a variety of sizes from a variety of brands all before you make a purchase. If you are shopping online, you should follow the brand’s specific sizing guide. Whether you are shopping from the brand’s site directly, or another retailer, a sizing guide should be provided. You can have someone help you take your measurements at home and follow the brand’s sizing guide to find the best pair of swim trunks. For online shopping, it’s also good to follow men’s swim trunks reviews. Men’s swim trunks reviews can tell you how the shorts have fit for other user’s dependent on their size. You should also remember that there are two aspects to the fit of your shorts. Swim trunks may have both the measurements for the waist and the length. The waist will be the circumference of your waist, so that your shorts can fit around your body. The length will be how long the inseam, or the pant part of your shorts, goes down your leg. 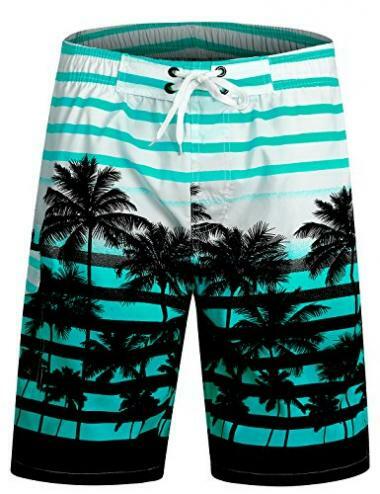 If you are shopping online, remember to measure out both measurements so that you aren’t surprised by a pair of swimming trunks that are too short for your taste. The size of men’s swimsuits is highly dependent on the specific brand. Brands tend to be similar in size, but not all brands feature the same size. How the sizes are measured will also be determined by the brand. Some sizes are measured in inches. This means that the waist, and if included, the length will be given in a measurement of inches. This makes the size of your swimming trunks for men very specific. You should be able to take your measurements and find a pair of swim shorts that correlate, in inches, to your size. Other men’s swimsuits are measured by the standard X-Small, Small, Medium, Large, Extra-Large, or Plus sizes. Sizes that are given like this will mostly likely have a sizing chart that correlates a waist measurement in inches to one of the provided sizes. These shorts will likely have an elastic waistband that can easily accommodate a difference of 2-4 inches in size. The size correlates with the fit. You will want to get the proper fit and size to ensure that your shorts are comfortable and won’t restrict or fall off of your body. The waist of your shorts may have a few different designs. 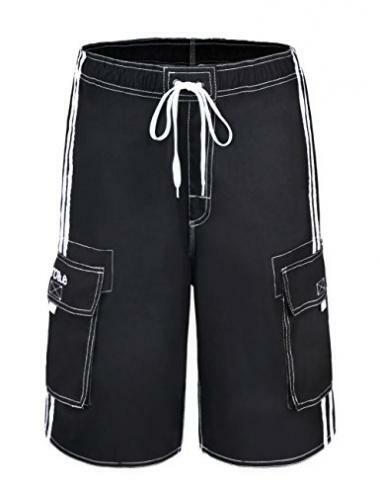 Some shorts have a traditional zipper and button closure, others have elastic waistbands, and the majority have drawstring closures. Shorts that feature a zipper and button closure often have a style that resembles regular shorts. They may appear less like swim shorts, to allow you to look more professional with a sleeker style in certain situations. These types of shorts are rarer and often, aren’t as likely to be found. When it comes to choosing between elastic waistbands and drawstrings, the recommended is often drawstrings. Elastic waistbands often dig into the skin, which can be uncomfortable. Elastic can also wear down over time. If you purchase your shorts and they fit perfectly, over time, the elastic can loosen, which can make your shorts unusable. Drawstrings allow for you to adjust your shorts to a variety of sizes throughout the day as your body changes. If you ate a big lunch and are resting before taking another dip in the pool, you can loosen your shorts and then tighten them again when it’s time for a swim. The design of your shorts will have a pattern. You can choose from solids to stripes, plaid or eye-catching prints. There isn’t a limit to the patterns that are available. The pattern will be entirely up to your own personal preference, but you should remember that it is one of the less important features. Fit and size should always come before pattern. The dry time will likely be dependent on the climate in which you live and the fabric of your swim trunks. Most swim trunks cannot be dried in a dryer and are better air dried. While you can’t control the climate, you can choose different materials that make the dry time faster. There are swimming trunks that have a quick dry fabric that will ensure that moisture isn’t held on for long periods of time. You will want to choose a pair of shorts that dry relatively quickly. The faster your shorts dry, the less possibility that they will cause chaffing. In general, you should choose a lightweight material that doesn’t have a liner. These types of swim shorts are likely the fastest drying time and the least amount of weight. Less material means less contact for possible chaffing. Durability is extremely important. Along with the size and fit, you want to invest in a pair of swim trunks that will last you for a variety of activities for a long time. It would be frustrating to have a pair of swimming trunks disintegrate, tear, or rip on the first use. Ideally, men’s swimsuits should be durable enough to withstand use in freshwater, chlorinated water, and salt water. They shouldn’t break down after extensive use. The best men’s swim trunks can be used for a variety of activities in different types of water. There are a lot of swimming health benefits and with top rated swim shorts for men, you should be able to swim anywhere from oceans and pools or even hot tubs. Most modern swim trunks for men are made of synthetic materials because they dry faster and are lighter. Materials like nylon, polyamide, or polyester tend to be the fastest drying and lightest weight of swim trunks for men. There may be designs that have a blend of natural and synthetic materials like cotton and polyester. Natural materials may not be the best choice because they are heavier and tend to take longer to dry. Synthetic materials will have quick drying features, but still be comfortable enough for you to use for a variety of activities. The best swim shorts for men should give a high performance. Whether you use them for surfing and pair them with a rash guard or go snorkeling and use swimming snorkels and a snorkel vest, your shorts should deliver top performance. Even if you are just relaxing on beach blankets and lathering on tanning lotion, your shorts should still offer top performance. The best men’s swim trunks will always have high performance for any situation. Their versatility ensures that you can be relaxed or active and still use a pair of top rated swim shorts for men. Q: Why choose swim trunks over a regular swimsuit? A: Depending on what you determine to be a regular swimsuit, there are a lot of different men’s swimsuit designs. The reason you may want to choose swim trunks over a speedo or specialized swim shorts, is because they are so versatile for a variety of activities. Swim trunks can be used when you are active or relaxing. You can surf, swim, snorkel, and even dive with a pair of swim trunks. Swim trunks for men also allow you to switch between activities without having to change your apparel because of their versatility. 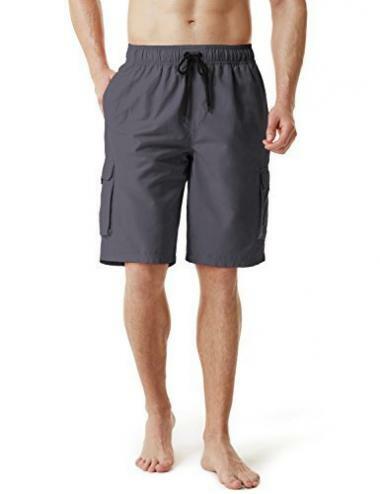 Swim trunks truly are a great universal men’s swimsuit that are comfortable and durable. Q: How to care for my trunks so they last longer? A: Your swim trunks should come with care instructions that detail how they can be cleaned and maintained. These instructions can tell you exactly how to wash them, in what temperature of water, which detergent to use, and how they can be dried. The best care is to wash or rinse your swim trunks after every use, especially if you have been in chlorinated or salty water. If you’ve been to the pool, hot tub, or ocean, you should rinse your shorts out with fresh water and allow them to fully dry. You may not always need to wash your shorts with a detergent, if they aren’t dirty with stains. Rinsing can rid the material of harmful or corrosive chemicals or substances, which will keep them looking like new and lasting longer. You should always remember to allow your shorts to fully dry between uses and before storage. Damp shorts can lead to mold, rot, and mildew; which can damage your shorts and make them disintegrate faster. Q: Can I wear my trunks in a swimming pool? A: Yes. Most swimming pool etiquette requires that you wear proper swimwear to use and enjoy the swimming pool. Swim trunks are proper attire for a swimming pool and can be used. Your short should be durable enough to withstand use for a swimming pool for a long time. Just be sure to rinse your shorts after every use to ensure that the chlorine can’t soak for a long time, which can cause damage to your shorts. When it comes to choosing a pair of swim shorts, it’s important to take the time to find the best men’s swim trunks. You want your shorts to suit your needs and feel comfortable for your body. There are a lot of different designs to choose from, but our guide gives you the top pick and all the information you need to find a pair of top rated swim shorts for men. If you know exactly what you want or need, you can save time and money. Do you own one of the pairs of swim shorts that made it onto our list? Let us know how it has worked for your water activity needs in the comments section below.